Title: BNSF 538, BNSF's Aurora Sub. Description: The east local passes through Lynxville enroute to Savanna, IL. 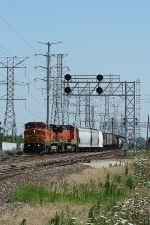 Description: BNSF B40-8Ws await assignments in Galesburg, IL. Title: BNSF 5503 waits for work in Galesburg! Title: BNSF 538 Roster shot of this old Girl! Description: WB L CHI107 tied down in the siding.